If you are looking for delicious homemade hamburger buns, then here it is. 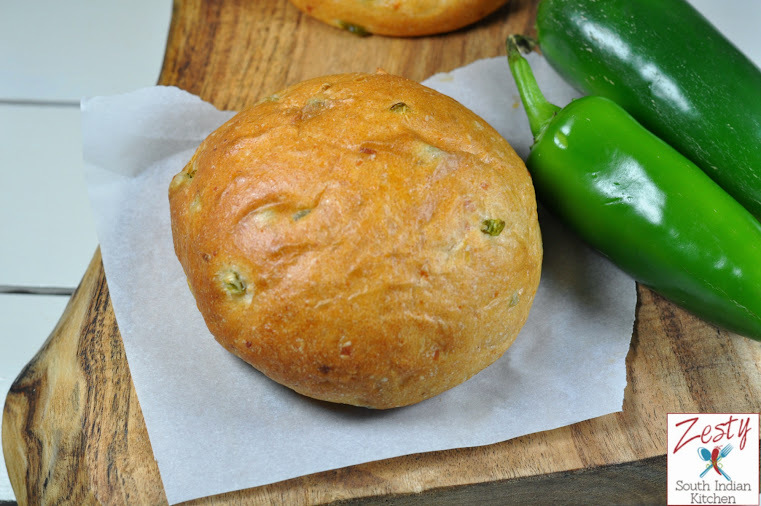 This Jalapeño cheddar wheat buns are one of the out the world. Delicious my almost 2 year old son asking for it, they are best when they comes out the oven. Of the baking expeditions last week, this one gave me immense satisfaction after disastrous failure of Jalapeño cheddar cornmeal whoopee pie and pina colada cupcakes. I don’t know eggless bakes are not favoring me. I never, able to get a smooth eggless cake, cupcakes right, so now I drop the idea of going eggless, it will save lot of money. 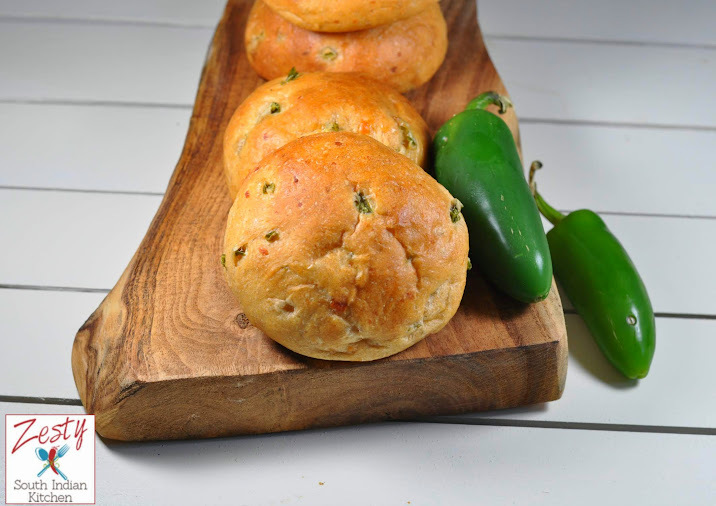 One more reason to try this recipe, because according to Texas monthly , these jalapeno cheddar buns are 3rd best buns for hamburger and it is served in Alamo springs Café, Fredericksburg. Jalapeno and cheddar cheese is a favorite Tex- Mex combo . Our next family trip will be to Frederickburg, Texas as hubby told me it is one of the beautiful and interesting places. I bought some jalapenos for making jalapeno poppers and also jalapeno cheddar cornmeal whoopie pie. However, I couldn’t find enough time to make poppers. Also when I tried whoopie pie it turned out to be not edible. So I decide to use Jalapenos in bread. While searching for the recipe, I found this one. Since I had cheddar cheese in my hand, I immediately went about to make it. Nowadays I am health conscious except for eating occasional desserts. I changed the recipe, as it was made entirely with All-purpose flour, to 2 cup of whole white wheat flour and one cup of All-purpose flour, and also reduce the sugar by ½ tablespoon. I had only 5 oz of cheddar cheese in hand, so used that one entirely. Skipped egg by adding potato flour as potato makes bread moist and keeps them fresh for few days. If you don’t have potato flour, use ¾ cup of mashed potato. Make sure to adjust the water content as mashed potato has water in it. Afternoon after serving lunch and milk to kids, as they take nap at that time, started making the bread, first rise took about 90 minutes. Then shaped them into 9 medium and 1 small buns and left aside for second rise which took about 30 minutes. The rolls were baked at 350 ⁰F for about 25 minutes; while baking cheese and jalapenos made an intoxicating smell. It is delicious; you can top it with any favorite topping. They make great sandwich buns, hamburger buns, you name it. If you lazy then try this combo of my daughter, she liked these buns with her favorite tomato ketchup. Don’t substitute any chili or cheese, this combo is ultimate. 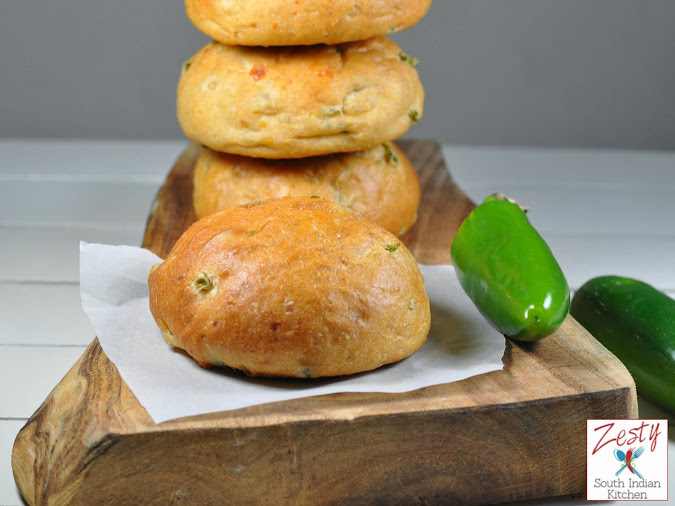 Sharp cheddar and fresh jalapenos makes simple burger buns into a Texas specialty. In a kitchen aid stand mixer bowl, add both flours, potato flour, salt, sugar, oil, yeast and water to form a soft supple dough. Add, cheese, and peppers and mix on medium-low speed with the hook until the dough holds together, about 2 minutes. The dough should clean the sides of the bowl. 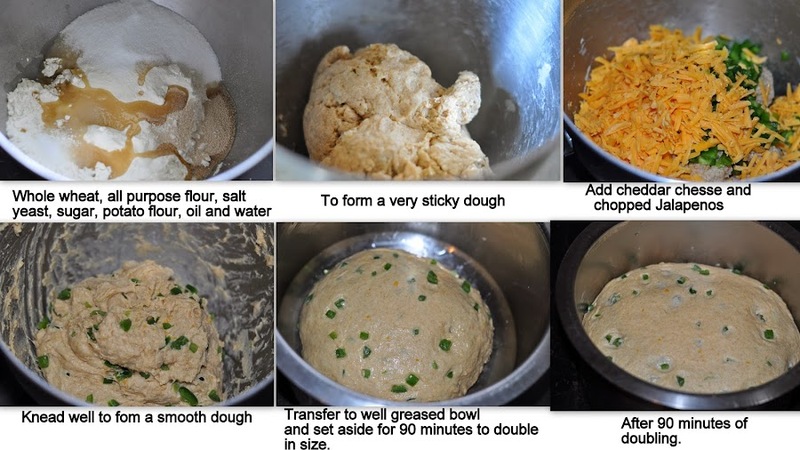 Divide the dough into 8 medium sized rounds as well as 1 small round. Roll into rounds and flatten with the palm of your hand onto the baking sheet; placing buns about 1/2-1 inch apart. Whisk the egg with 1 Tbsp water. Store leftovers in zip-lock bag at room temperature. They freeze well, too. This recipe is inspired from here, Foodie bride . Those sound fantastic! Definitely want to give these a try…bookmarked! Perfect savory homemade buns Swathi!!! Swathi, I am definitely making these soon! 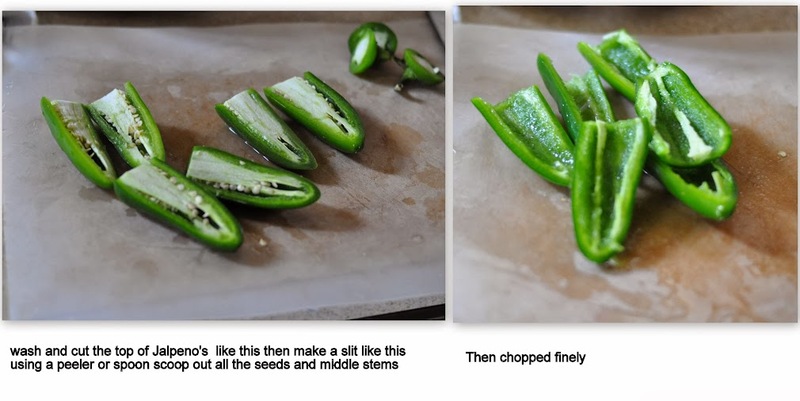 I have some frozen jalapenos from the garden…Bookmarking the recipe! Those look so good.. I love spicy breads.. 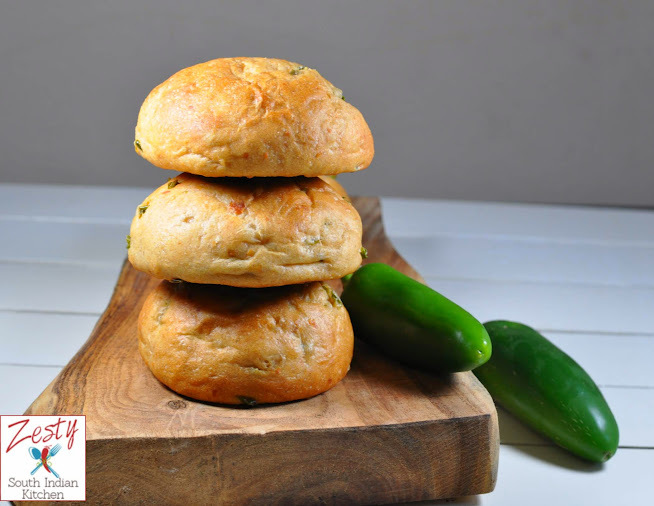 Simply delicious and lovely looking cheddar buns blended with Jalapeno. Excellent preparation. Looks super good. What is the reason behind adding potatoflour? Uma potato flour, helps to make buns soft and moist for few days. Such soft and perfectly baked buns Swathi, they look so amazing …. Ohff yummy looking bun with jalapeno. wow like these cute buns 🙂 wish to have it rite now..
Buns look soft and delicious. 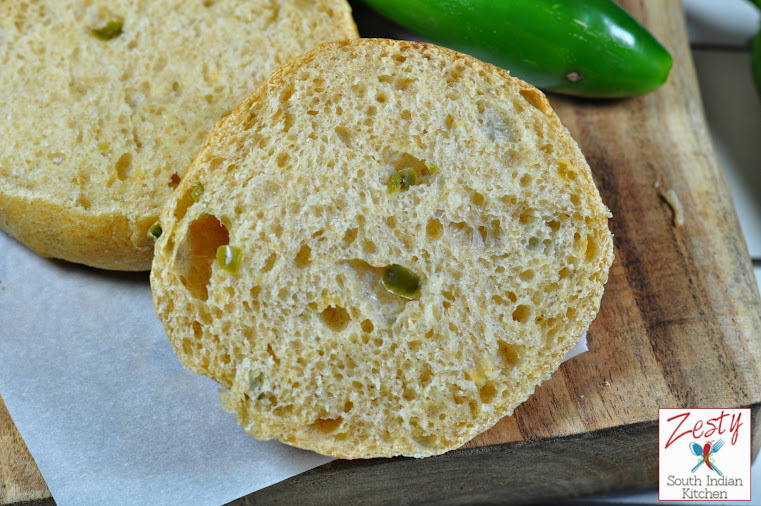 I like the addition of Jalapeno in your home baked buns. Home baked food is always special being customized and specially made. Not sure if you stopped at one, I could finish all of those. It looks so good Swathi. Oh my goodness, I want this NOW!! This looks fantastic, I absolutely love the jalapeno and cheddar combo! Perfect buns! The jalapeno and cheddar sound awesome! To heck with the burger – just give me the bun!!!! WOW!!!! looks lovely , love the jalapeno buns. These are gorgeous buns! I love the delicious combo of cheddar and jalapeno. I bet they make the best sandwiches!